Happy Friday, friends! I can’t believe we’ve blown through another week and it’s time for the weekend. I’m excited about it and ready for lots of time with my boys. We don’t have much planned, which happens to be my favorite kind of weekend. Anyone else relate? I just realized this gingham dress sold out and I’m sorry I waited too long to share it with y’all! I’ve had it about a month and it’s been one of my favorites, but you could easily recreate a similar look with this dress. 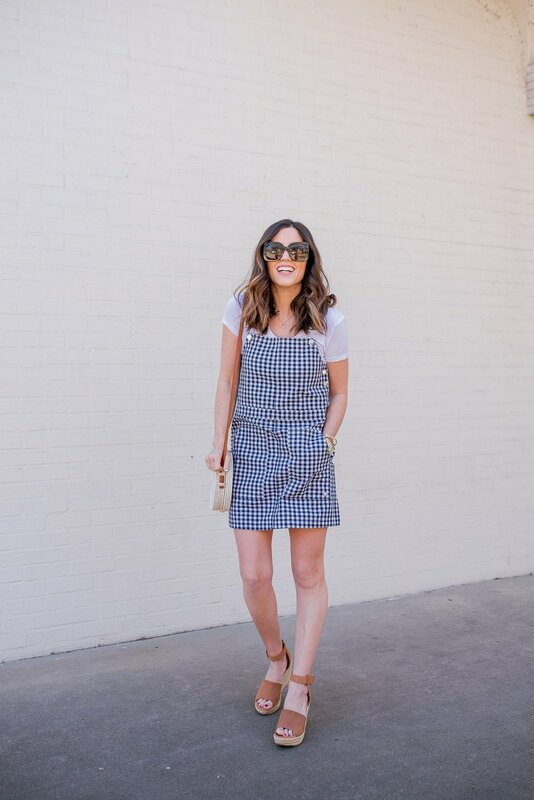 I love how casual yet cute pinafore dresses are and hope it’s a trend that stays around awhile. I also really like wearing slip-on sneakers with this look, especially when I’m on mom duty. I thought gingham might die out after last summer but it’s definitely back in full force for summer ‘19 and I’m not mad about it. Wishing you all a wonderful weekend! Bear is super excited because his cousins are coming in town which means lots of playing at the park. I’m sure Boone will be right in the middle of it as well, now that he’s walking. I should have my hands full but in the best way!